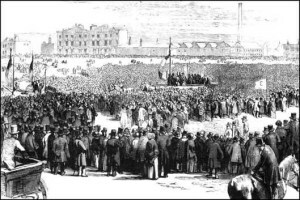 Democracy – The long and often bloody fight for freedom – The Chartists. Just another step on the way. The Chartist aims were simple; they wanted one man one vote for all men over the age of twenty one who were sane and not criminals and payment for MPs (So that those other than the extremely wealthy could stand). That sounds very reasonable to me. I mean it wasn’t as if they were asking for votes for women. Heaven help us if anyone thought that women might be intelligent, knowledgeable or able to exercise the right to vote. ← Democracy – The long and often bloody fight for freedom – The Peterloo Massacre.